Goggles have traditionally been cast as just being used for snow skiing and other related sports. But there are so many other reasons to wear Goggles that sales for these sunglasses have really spiked recently. Besides having other reasons to wear goggles, they are also much more attractive then they once used to be. Goggles are still worn for snow skiing but are also worn for many other sports as well. Snow Boarding, Bicycling, ATV and Off Road, Skateboarding, Running, Track and Field sports and many others. With the popularity of these it has had many changes in the style of the frames. Manufactures have listened to what consumers are saying about the style and function of goggles. Sports enthusiasts really want goggles that are light weight, comfortable and that stay on their faces where they are supposed to be while they are working out. By listening to what customers are saying many changes have been made to make these goggles more functional but also great looking. Many of our wholesale goggles now come with designs on the straps, smaller lens frames, foldable frames that fit easily in pockets and many other changes. 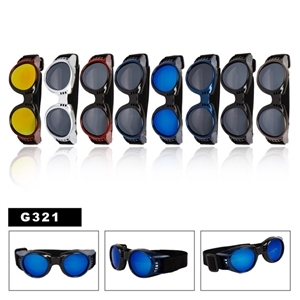 But sports enthusiasts are not the only people that like these great sunglasses; Motor Cycle riders are also quickly becoming some of the best customers for them. Goggles are great for motorcycle riders because they typically fit over or under motorcycle helmets and fit quite comfortably both ways. They are also sometimes foam padded keeping the riders eyes safe from flying debris, and sweat. So from now on when you think of Goggles, you will think of a stylish pair of sunglasses that you can wear anywhere at anytime! 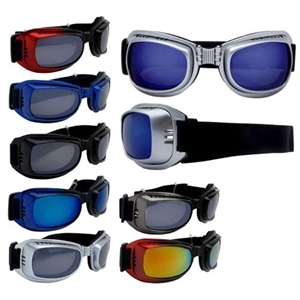 For wholesale goggles you have came to the right place.